Andrew Michael Edgar Seeley (born April 30, 1982) is a Canadian-American actor, singer and dancer. He has recorded many songs for the Walt Disney Company. He danced as a child in Ontario until he was about preteen age and then moved to Florida. Seeley is married to actress/comedian Amy Paffrath. Seeley grew up in Toronto and fell in love with performing. He was once part of a boy band called Nu Ground. He was cast in Hal Prince's revival of Showboat and stayed with the production for a year. In 2005, Seeley started working with Ray Cham, an established producer and together they wrote "Get'cha Head in the Game", a song that was a nominee in the Creative Arts Primetime Emmy category, Best Original Music and Lyrics. Drew Seeley performing with Vanessa Hudgens. In 2005, Seeley began working with established producer Ray Cham and together they wrote "Get'cha Head in the Game" for Disney's quadruple platinum High School Musical soundtrack. His voice had been blended with Zac Efron's voice for the character of Troy Bolton in High School Musical. This garnered them an Emmy nomination in the Best Original Music and Lyrics category. In addition, Seeley filled in for Efron (who was shooting Hairspray) on the North America and Latin America tours of High School Musical: The Concert, playing in 60,000 seat arenas and he can be heard on both soundtracks and High School Musical on Stage!. Seeley's association with Disney continued and he can be heard as a featured artist on several Disney soundtracks/compilation albums including Disneymania 5, Disneymania 6, Disney Channel Holiday, Radio Disney Jams, Vol. 9, and Byou. Drew's duet with Spanish-born Mexican singer Belinda "Dance with Me", from the platinum Cheetah Girls 2 soundtrack, was played on the Disney Channel and on Radio Disney. Drew appeared in Belinda's video of "Ni Freud ni tu mamá". Drew also made a guest appearance on the current Chipmunks CD Undeniable, singing an updated take on "Shake Your Groove Thing" with Alvin and the gang. Seeley appeared in the Hallmark Channel Movie Claire opposite Valerie Bertinelli, and in the film Fly Kidz, which he co-wrote and produced the soundtrack. He also wrote and performed music for the Disney Channel Original Movie Jump In! starring Corbin Bleu and Keke Palmer. Seeley starred opposite Selena Gomez and Jane Lynch in Another Cinderella Story, playing the pop star Joey Parker. Drew wrote and performed four songs in the film, and shot music videos for both versions of his hit song, "New Classic". Seeley also appeared in Disney Channel Original Movie Stuck In the Suburbs as a hotel employee. In the summer of 2009 he starred as Prince Eric in the Disney Broadway Musical The Little Mermaid, and had a leading role in the horror movie The Shortcut. In June 2010, Seeley starred in the Hallmark Channel television movie Freshman Father. Drew has recently been touring the US as "Bob Gaudio" in Jersey Boys. Seeley's album The Resolution was released on April 5, 2011. In support of the album, Drew went on a national tour where he performed his own original music. He also sang a song for the Disney Channel original series Shake It Up. A duet with Adam Hicks, "Dance for Life," premiered in the episode "Vatalihoosit It Up", backed by a routine performed by dance crew the Jabbawockeez. "Dance for Life" was featured on the soundtrack for the show, Shake It Up: Break It Down. Seeley's song "It's Always Been You" was used as the theme of A Princess For Christmas, a 2011 Hallmark Channel movie. On June 12, 2011, Seeley was reported to have joined the CW's hit teen drama series 90210, but Entertainment Weekly later reported that he dropped the role due to his conflict schedule. In March 2012 I Kissed a Vampire was released, in which Seeley stars alongside Lucas Grabeel and Adrian Slade. In June 2012, he co-starred in the Lifetime movie, "Talhotblond", posing as young "Tommy". Seeley has also released music videos for his song "Beautiful", and most recently "Into The Fire". Drew recorded a song for the third Shake It Up soundtrack Shake It Up: I Love Dance, called "I Do". It only featured on Walmart Exclusive editions as a bonus track. The song was also featured in the Shake It Up season 3 episode, "I Do It Up". In 2013, Seeley began filming his role in a new film, Elixir, which was renamed to Lovestruck: The Musical on ABC Family, where Seeley played the role of "Young Ryan". He played opposite Chelsea Kane (Young Harper), Jane Seymour (Harper), Sara Paxton (Mirabella), Tom Wopat (Ryan), and Alexander DiPersia (Marco). He is featured singing his rendition of Usher’s "DJ’s Got Us Fallin’ in Love". In conjunction with the new movie, Seeley co-wrote and performed "Here & Now," the theme song to ABC Family’s spring promotional campaign. The song was featured on Seeley’s dance-pop EP released in April 2013. 2008 The Suite Life of Zack & Cody David/Jeffery Episode: "Romancing the Phone"
2010 The Closer Boyd Martin Episode: "Jump the Gun"
2012 Trend This! Himself Episode: "The Dance"
2013 Minute Motivations Andy Episode: "Holiday Special"
2014 The Interrogationists Jason Vance Episode: "The Husband"
2014 His & Hers Jason Episode: "All Your Friends Are Men"
2014 CoffeeHouse Brandon Sherwood Episode: "Pilot"
^ "during a performance of the sketch comedy show Top Story! Weekly". TV.com. Retrieved 2009-06-20. ^ "Who Are the Real Student Bodies". Archived from the original on June 16, 2008. Retrieved 2009-06-20. ^ "Drew Seeley Interview". Feeling the Vibe. April 26, 2009. Retrieved 2009-06-20. ^ Andrew Gans (June 9, 2009). "Little Mermaid Welcomes Drew Seeley June 9". Playbill. Archived from the original on June 12, 2009. Retrieved 2009-06-20. ^ "One Freshman is Earning his Degree in Daddy. Emmy Nominee and 'High School Musical' Singer Drew Seeley, Golden Globe Nominee Annie Potts and Four-Time Emmy Winner KimZimmer Co-Star in Freshman Father. A Hallmark Channel Original Movie Premiering June 5" (Press release). Hallmark Channel. April 6, 2010. Archived from the original on November 21, 2011. Retrieved 2010-05-13. ^ "Drew Seeley & Keith Hines to Join Cast of JERSEY BOYS National Tour". ^ "TWIST Chats with Drew Seeley!". Twist Magazine. Twist Magazine. Retrieved 12 April 2012. ^ "Drew Seeley Is The Little Mermaid's Handsome New Prince". Broadway.com. 2011-05-30. Retrieved June 4, 2011. ^ "ACME Comedy PHOTOS!". Drew Seeley Official Website. 2011-05-30. Retrieved June 4, 2011. 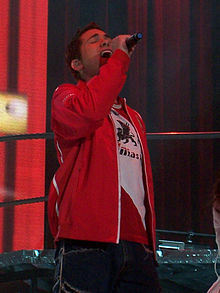 ^ "Drew Seeley Joins The Cast Of "Jersey Boys" National Tour". Disney Dreaming. 2011-05-30. Retrieved June 4, 2011.